Patrolman Gustave August Boettger, Jr.
Patrolman Gustave Boettger died of injuries he received when he was thrown from a horse. Patrolman Boettger was on mounted patrol in Brooklyn when a horse pulling a wagon got out of control. The driver of the wagon jumped out, leaving another man in the wagon. Patrolman Boettger ranged alongside the runaway horse near Fulton Street. He continued next to the runaway horse and seized the animal by the bridle. An automobile drove directly into the path of the horse, causing Patrolman Boettger's horse to come to a stop. The runaway horse swerved, and Patrolman Boettger was pulled from his horse and dragged for half a block. The runaway horse swerved again, running into an automobile, and Patrolman Boettger was struck by the left forward spring of the automobile, causing a skull fracture. Several citizens helped Patrolman Boettger to his feet. 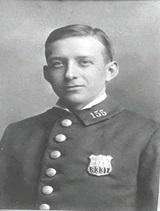 Patrolman Boettger, dazed and bleeding, pulled away from them and again mounted his horse and started after the runaway. Another mounted patrolman joined in the chase and was able to capture the runaway horse. Patrolman Boettger kept up the pursuit until he saw the runaway horse captured. He then fell from his horse to the roadway. Patrolman Boettger was taken to Swedish Hospital, where he partially recovered from his injuries. He died twelve years later as a result of his skull fracture. 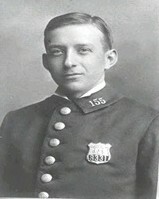 Patrolman Boettger served with the New York City Police Department for 14 years. He was assigned to Traffic Precinct D.